It’s half term! 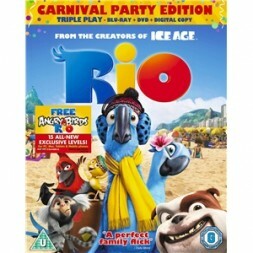 And if you’re looking for something to do with all your free time, the funny animated film Rio has come out onto DVD. In case you haven’t seen it, Rio is from the creators of Ice Age, this time set in the much warmer climate of Brazil. It follows Blu, a ‘nerdy’ bird who can’t fly, who ends up finding himself in sunny Rio where he ends up encountering everything from love, to thugs involved in an exotic animal theft ring, and even an overly friendly slobbering bulldog! This is a funny film well worth checking out, and the Rio DVD packs also contain free 15 new levels of Rio Angry Birds!